The mission of NINDS is to seek fundamental knowledge about the brain and nervous system and to use that knowledge to reduce the burden of neurological disease. Mostly when we think of that last part, about reducing burden, we think about translating basic neuroscience research into pharmaceuticals, implantable devices, and other treatments such as gene therapy or stem cell therapy. However, reducing burden is not always accomplished through clinical intervention. Sometimes it simply means restoring happiness, comfort, or dignity to suffering patients. Recently, a new product funded in part by NINDS Small Business Innovation Research (SBIR) grants has hit the market with the potential to reduce the burden of nearly 11 million individuals worldwide with essential tremor (ET), Parkinson’s disease, and related disorders. Individuals with these disorders experience persistent tremors—or rhythmic shaking—throughout their body, though sufferers of ET shake mostly in their hands. The new product, called the Liftware Stabilizer, is a spoon that counteracts tremors that occur in patients’ hands and helps minimize spills that can make eating in social situations an anxiety-inducing affair. 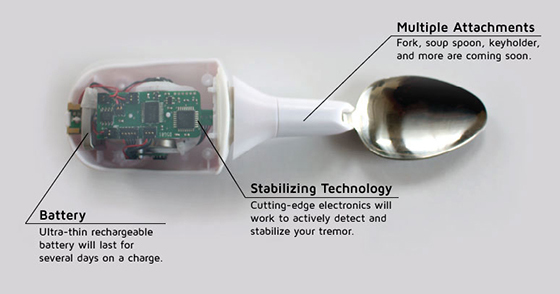 The way the spoon works is that sensors embedded in the handle detect tremors, which are then compensated for by tiny motors. For example, as the shaking hand dips unexpectedly downward, the motors push the bowl of the spoon upwards relative to the handle just enough to offset the movement. A sharp movement to the right causes the motors to push the bowl back to the left. The net result is that the spoon stays steady and level, even during severe tremors. Attachments can be swapped out to convert the spoon into a fork and a deeper spoon for soup. The Liftware Stabilizer is made by Lift Labs, a San Francisco-based company that was recently acquired by Google’s Life Sciences division as part of the tech company’s recent flurry of biotechnology firm acquisitions. In addition, the company has raised enough money through foundations and charitable contributions to donate a few hundred spoons to folks who could not otherwise afford one. The idea for the smart spoon was conceived of by Lift Labs founder and CEO Anupam Pathak. During his years as a graduate student in engineering, Pathak worked on projects for the Army Research Laboratory geared towards stabilizing weapons for soldiers in combat. Near the end of his studies, he realized that the same principle he was using to stabilize weapons systems—active cancellation of unwanted movements—could be applied to helping individuals with ET and Parkinson’s offset their tremors at the dinner table. Upon graduating in 2010, Pathak applied for and received a Phase I Small Business Innovation Research (SBIR) grant from NINDS, which provides funds specifically for small businesses doing research and development on products—including devices, therapeutics, diagnostics, and research tools—that have the potential to reduce the burden of neurological disease. Pathak sought funding from NINDS so his company could focus fully on developing their technology, at a stage when private investors are usually not willing to invest. Lift Labs used the Phase I SBIR award to perform feasibility testing on the spoon, and then, based on its Phase I success, the company was awarded a two-year Phase II grant for further development. Part of the NINDS SBIR award supported a small clinical trial that demonstrated that subjects who used the spoon experienced an average 72% decrease in tremor amplitude while eating. As a Phase II SBIR grantee, Lift Labs became eligible for the Commercialization Assistance Program (CAP) run by the NIH. This program, which has benefited more than 700 companies since its inception in 2004, provides free access to industry-seasoned contractors who help grantees develop their commercial business. Lift Labs’ industry mentor helped the company develop a commercialization strategy for obtaining funding to build the facilities to manufacture the finished product. This plan helped the company quickly bring their spoon to the marketplace a mere six months after developing a fully functioning prototype. The CAP mentor also helped Lift Labs navigate the regulatory hurdles for taking their invention to the public. Director of NINDS Small Business Programs Stephanie Fertig and NINDS Program Director Beth-Anne Sieber provided additional assistance to Pathak and Lift Labs. The Liftware Stabilizer is a truly remarkable device that can make an enormous impact on the lives of individuals living with moderate to severe tremors. NINDS is proud to have helped support its development and we hope in the future to fund products and technologies with a similar goal of reducing patient burden. Read about more NINDS Office of Translational Research success stories here. Please check the Liftware Website for purchasing. Thank you. Maybe this will post a more complete version. One of the best discovery made for tremor patients. Nice research and outcome. I will try to share this with my friends.